The easiest way to push a lie is not to say the lie directly. It is to say something else, preferably an inspirational story that gets people emotionally involved, and then parenthetically relate it to the lie. When people who are already invested in a story see the ancillary falsehood, they are far more likely to believe the lie because their guard is down. 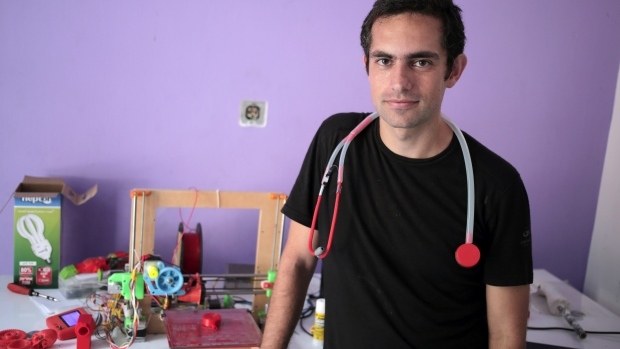 A Palestinian-Canadian doctor has created a low-cost stethoscope using a 3D printer, the first in a series of inventions he hopes will help alleviate medical supply shortages caused by an eight-year blockade on the Gaza Strip. Dr. Tarek Loubani says his stethoscope can be made for just $2.50 — a fraction of the cost of leading brands — and some doctors say the equipment is just as good. The shortage of basic medical devices in the isolated Palestinian territory “is something that I think we can translate from a big problem to a big win for us in Gaza,” said Loubani, an emergency medicine doctor from London, Ont., whose Glia Project aims to provide medical supplies to impoverished places like Gaza. Hospitals have been struggling since the militant Hamas group took over the Gaza Strip in 2007 and Israel and Egypt imposed a blockade on the territory. The import restrictions have led to shortages of medicines and basic supplies like medical consumables and IV bags. There are no Israeli restrictions on stethoscopes to Gaza. Gaza doctors and hospitals can order all the stethoscopes they want and the devices will be delivered quickly through Israel and the Kerem Shalom crossing. Now, there is nothing wrong with providing low-cost stethoscopes via 3D plastic printing. The story could have been written from that angle, saying that this innocative Canadian doctor of Palestinian descent had come up with a way to provide cheap but high quality stethoscopes to help out Gaza medical professionals who cannot afford them. 3D printers in Gaza may be problematic – people have built plastic guns with the technology, so they sound like a dual-use item that may be restricted – but apparently there a;ready is at least one is in Gaza already and using it for medical technology is laudable. But the idea mentioned multiple times in the story that Israeli restrictions are the reason for the shortages is nothing short of slander, and AP must be held to account for pushing this lie.